I am working on a three act quest and part of the quest involves a new mini-boss named Gar the Unruly. Here’s his WIP card below. 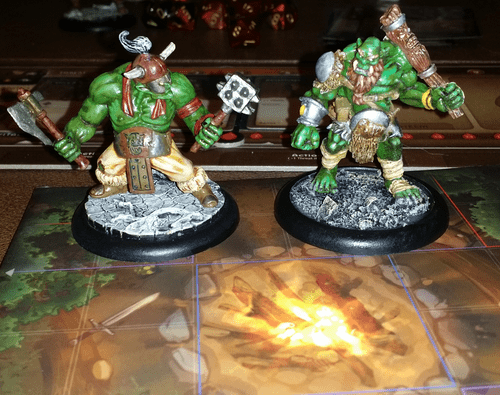 Pretty cheap way to add a new Mini-Boss, and exactly what I envisioned when I purchased Myth (community enhancements complete with miniatures from other sources besides McG). He is about 47 mm tall (to top of head) and 55mm to tip of club so he’s in the range of the Muckers and won’t look out of place as a Mini-Boss. Yardu is about 52mm tall. I will probably mount him to a base that gives him a little more height as well. I’d love your feedback on this character. I haven’t played him yet, so he may be too easy, too hard, whatever. Please let me know. I am still working on some of these names, but I like the abilities. This guy’s priority is least vitality so he’s going after the weakest first and pounding with an ability that is “per success” so he can really wreak havoc quickly (maybe too quickly?). Hope you all enjoy! I will continue to make changes and include in the Story Quest I am working on. A huge thanks to Tom, Mathue, and David for paving the way and inspiring me to contribute. edit: included the guys above. Hit submit too early. edit: Updated card to reflect "Hero(es)"
My only suggestion would be to change the icon that has the 4 in the priority box to the Threat Range Icon. Currently you are using the Boss AP Icon. Unless of course you want this mini-boss to generate 4 AP every Refresh Phase. Otherwise he looks pretty good and he is definitely tough due to multiple successes needed to hit as well as the Heroes needing to pass a courage test to even attack! Edits made and uploaded to original post. Shouldn't it be "knocks hero(es) prone"? Indeed it should! Thanks, Mike! 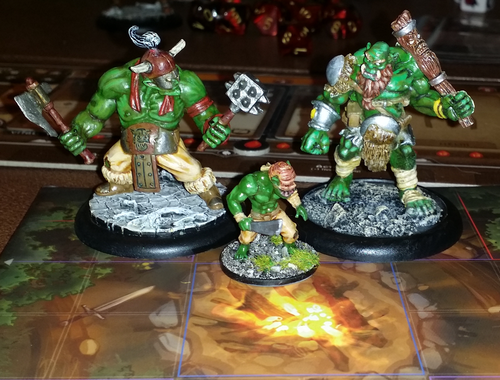 exactly what I envisioned when I purchased Myth (community enhancements complete with miniatures from other sources besides McG). Just so I'm clear, "requires 2 successes to hit" means a hero must roll at least two of their D10's at 7 or more in order to successfully hit? If that is correct, I like it - especially the descriptor: Rhino Hide. As for Club Drubbing, I think this is overpowered, as you only need a success of 4 on those 3 D10's, and then you're doing 6 damage (provided you roll 4's or above on all three die). My impression is this guy is sort of like a cave troll, so the Hero's should see his swing coming a mile away, so perhaps a hit value of 6 would be better (and keep the 2 damage per success)? I don't know. I'm sure once you play him a few times you'll find out if this attack is overpowered. As for names, I like "Troll Bait" - which is somewhat meant as a play on internet slang. For your estimated percentages, did you consider that Special Abilities activate from the bottom up? It seems like it would be a little less likely that Channel Shaman would activate. It also seems like a tough calculation. I think Humbling Stomp could be a little clearer that it attacks all Heroes within range. Also, since all Heroes have the same TN, wouldn't Gar roll just once for all Heroes? If so, then I think there is a decent possibility that all of the Heroes could be knocked Prone at some point. If that happens, then there would be a Loitering penalty if played by the book. Not a problem, but I thought I'd point it out in case you hadn't thought about that. Like Ben said, Club Drubbing is tough....but Yardu has some tough attacks too. Plus, there's nothing wrong with a tougher miniboss. How long does Blunt Bash buff Minions? The way it's worded, it appears to be permanent....which is fine if that's what you want. If it's intended to be only this Darkness Cycle, then you have to keep in mind that Minions attack before the Miniboss. Same thing for Inspire... Minions attack before Minibosses, so it's difficult to see how this would be implemented. Although, it could be reworded to a bit to indicate that Minions receive an immediate second attack. As is, he's definitely one tough cookie. I'm all about tougher Monsters, so I give it . Thanks for this, I like him, tough is good. Humbling Stomp's range of 3 seems pretty large for such a small mini. Also, why wouldn't it knock minions prone? Seems like it is a localized earthquake like effect that would knock everyone prone. My question is. What's the base size? Wow ... I'm out for a couple of days and there's all sorts of great questions and comments to react to. Thanks guys!! Appreciate that, Ben. Since stumbling on Myth, I felt it really lended itself to rich community content. As a collective community, we have so much more creative power than McG (no offense meant ... they are a small organization with multiple games to keep them busy). McG committed to a new patch each quarter. We as a community can do that much more frequently. Hopefully additions like this represent just the tip of the iceberg. - I liked that name too. Yes, you must have 2 successes in your attack dice pool to hit. Of course that's after passing a courage test. Yeah, I've been thinking about the balance here too. I want this guy to be tough, but not ridiculous. I pushed the success to 5 instead of 4. Some days more appropriate here than others. I calculated the individual probabilities and did not consider how they interacted with one another (since you can't have all 4 conditions at once it would have been a nightmare to calculate). Those percentages were the best I could come up with. Any math wiz out there, please feel free to assist! I'd love to hear how McG calculates these probabilities. Maybe Brian's a Math Savant. (Edit: I guess Heroes would have to spread out to ensure that doesn't happen...). 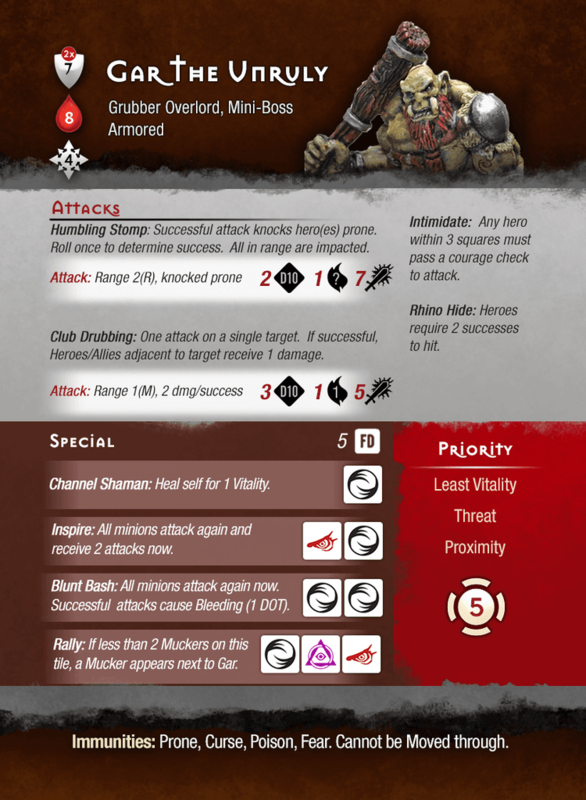 I added some text so the attack roll is more clear. Is that better? As for loitering ... this is one of those gray areas for me. I like the spirit of the penalty, but there are some exceptions to the rule at my house. 1) If you spend AP and then have a condition (like FD roll) that negates, we say you spent AP. 2) If something tragic happens (like Gar knocking everyone prone) then loitering doesn't trigger. Maybe a little gamey, I know. I wanted this to be a pretty devastating attack to anyone nearby. I am definitely open to suggestions on how to tweak this to better suit the community, however. I spazzed on the wording here. I intended for the minions to receive extra attacks that were buffed by these abilities. I reworded the card to be more clear. Thanks Mathue! 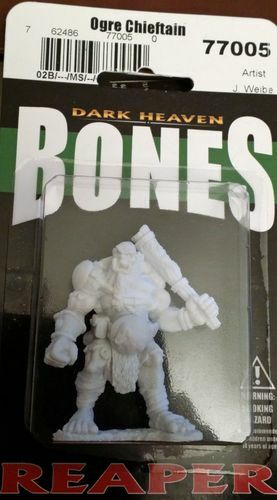 Is this bones miniature perfect? No, but it's one I had, and one that most can pickup for less than a coffee at Starbucks. It was my intent to design this off a readily available and cheap miniature. I don't think he's that far off from being believable as a Mini-Boss. Here's how he compares to the Muckers and Soldier. It's tough to tell, but he's similar in size to the Muckers. I don't consider him "small" but as I'm new to this miniature scene, maybe he is by community standards. Also remember he's not properly based (IMO). My intent is to create a larger base that he stands on so he appears larger. The localized earthquake effect IS what I was going for with this attack however. Not big, nor "standard" as you can see in the photo above. I am definitely going to rebase onto a 40mm circular base. 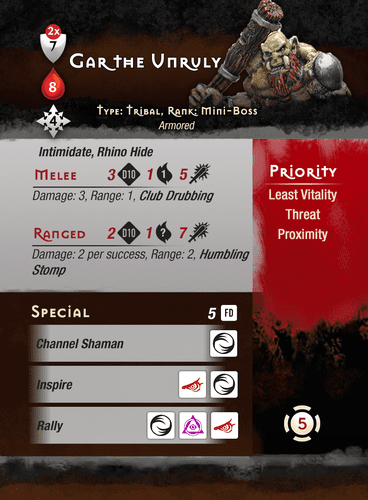 Card updated to reflect changes noted in this message. Cool card. I especially like that you chose a readily available miniature, which also looks enough like a grubber or mucker to fit the theme. Makes it really accessible and generally useful. “Humbling Stomp” seems a tad over-powered for a miniboss, at least until the Heroes get the Title that lets them ignore Prone. Specifically, it has too large an effect area. He’s a miniboss, so he’ll be on a 2x2 base. That means there’s an 8x8 area affected by this power, which doesn’t leave much room to maneuver away from a guy who also moves 4 towards the Hero with the least vitality. On top of that, the power fairly consistently costs all players an entire HC, which means that frequently Gar will get a second activation (and minions will get to attack 2 or more times) before the Heroes get to stand up. Which wouldn't be an issue if it wasn't hitting all the players at once. As cool as “Rhino Hide” is, I don’t think you actually need the text there. It’s the same “power” that Yardu has, which is already communicated by the “2x” above his defense shield. Having it also listed as a power on Gar is inconsistent (in the context of Yardu not having such text), redundant, and confusing. While most people wouldn’t misconstrue it, it’s not impossible that someone could interpret that to mean attacks against heroes require 2 successes (because they’re hiding from this rhino-sized monster, and thus harder to hit). I know that sounds a little stupid, but given all the interpretation issues Myth has, it’s better to be crystal clear, and in this case clarity is improved by just removing the text entirely and letting the little “2x” do its job. The different wording between “Inspire” and “Blunt Bash” is confusing. Is “and recieve 2 attacks this cycle” meant as a clarification, a restriction, or an extra bonus beyond just attack again once? If my 5 FD came up 3 darkness, 1 rage, and 1 Faith, how many total times would Minions attack this darkness cycle? Depending on how I parse the text of “Inspire”, the answer could be 2, 3, or 4. If you intended that roll would result in a total of 3 attacks (2 now and 1 earlier before the miniboss attacked) then I would recommend deleting “and receive 2 attacks this cycle” or replacing it with the word “now”. The wording needs to be clear regardless of activation order, which I gather will be different on some of the darkness decks in wave 2. The restriction to 2 Muckers in “Rally” may need rewording. 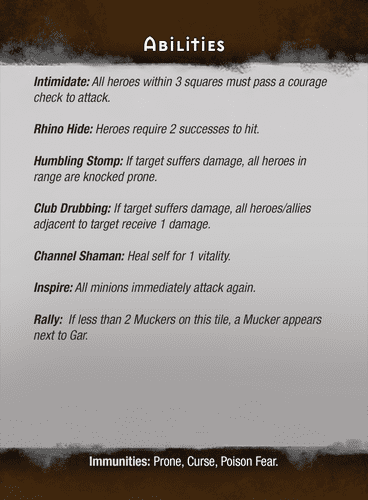 I would suggest “Rally: If there are less than 2 Muckers on this tile, a new Mucker appears next to Gar.” Currently, it’s not impossible (just unlikely, and for most of us it’d require a proxy) for 3 Muckers to be on a tile (placed there via quests or unlucky darkness card spawns). If that happened prior to Gar rolling Rally, when he did roll it there’d be some awkwardness. Not gonna come up often, but when it does it'd be confusing. As cool as “Rhino Hide” is, I don’t think you actually need the text there. It’s the same “power” that Yardu has, which is already communicated by the “2x” above his defense shield. Having it also listed as a power on Gar is inconsistent (in the context of Yardu not having such text), redundant, and confusing. Yardu actually does have his 2x ability listed. It's his Shield ability, and it's why I listed a similar ability on one of my minibosses as well...to stay consistent. I agree that the wording is still not clear on these two abilities (Inspire more so than Blunt Bash IMO). The normal attack by the Minions and the Inspire/Blunt Bash attacks by the Minions all take place within the same Darkness Cycle. Using the word "cycle" actually muddies the water a bit. Exactly why I wanted to post this here and get feedback! Really appreciate you taking the time to respond with suggestions. Every one of these made perfect sense to me. I reduced the range on this to 2 squares. I'd like to leave it there and see how this plays out. The localized earthquake effect should be more than range=1 in my mind. Great catch. I want to be consistent for sure. 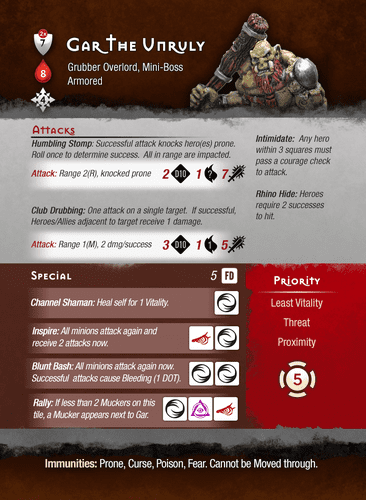 Maybe I can come up with another new monster that uses "Rhino Hide" in some other way. I did like the name, however. I cleaned up the text per your suggestions. 3 Darkness and a Rage would be pretty devastating and an unintended result. Now that you point this out, I think I want to leave it in. If you roll this, all minions would receive 3 additional attacks. Yikes! I knew I saw that somewhere! Thanks Matthue, I re-instituted the text on the card. Those paint jobs look great! Any advice for a complete mini newbie? I love your bases too. 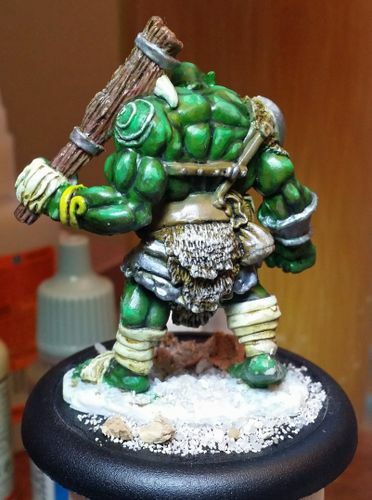 What kind of paints do you use, where do you get your bases, etc? Along the lines of a new mini-boss, what do you think of this character as a Myth mini-boss? I would like to have some semi-powerful villain (non-boss) with multiple melee attacks. Any recommendations from the creative community on abilities or a name? I have that figure and she is a little on the small side for a mini boss. Thanks Sean. 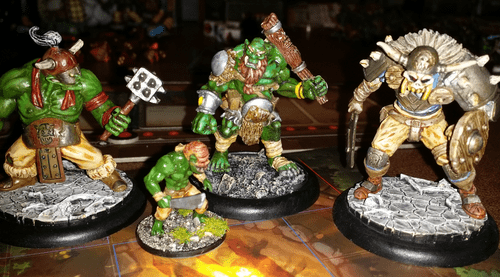 Myth was the first time I ever tried painting miniatures, so while I have painted the entire base set, I still consider myself a neophyte as well. I did a fair amount of research before painting my first mini. Here are a few youtube channels that helped me a great deal. There's enough content above to keep you busy for months. As far as paints go, I use Vallejo Model Color for the most part. I contemplated going the craft store route but have seen some really bad craft store paint jobs on nice minis. A good painter can use them with good results, but I didn't want to chance it. The key is using thin layers so you don't loose the details on the mini. 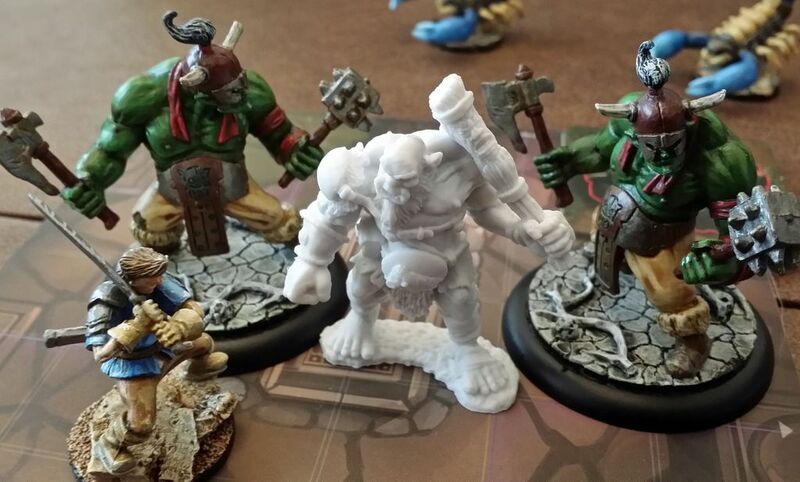 They are still on sale for $1.81 - a steal for a 50mm resin base. Happy to answer other questions, just let me know. I think I will use Descent Giant to proxy him or something like that. You have a mistake on the card: should be "Affected" not "effected". A few WIP images to share. I am mostly done except for the base. I know there are some spots that need touch-up. Especially the feet, but since I am going to be in there with a brush on the base, I don't consider the bottom done quite yet. I'll post completed images when I get there. 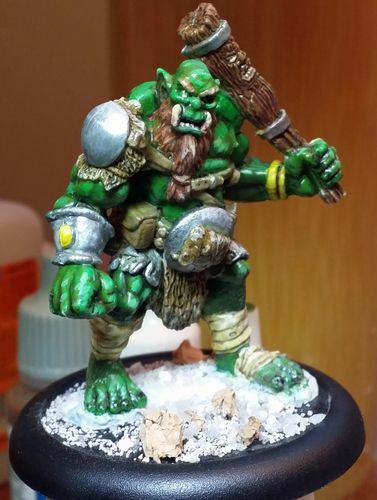 Okay, I finished up the Big Ugly Guy this morning. I am pretty pleased with the results. For less than $2 and a little time, I've created a character that I believe is missing from the whole game itself - a Grubber Mini-Boss. I have heard some have tried out Gar and enjoyed his play. That's great! For those interested, all his cards are part of my Story quest posted here. I snapped some images of Gar along with a Mucker, Grubber, and Yardu for size reference. I think he's completely believable as a Mini-Boss (size wise) and fits directly into a spot left vacant in the original game. Thanks for all the feedback and encouragement. This isn't the last of my creations that I'll share. A little thread Necromancy going on here. I created this Mini-Boss ages ago and never converted him over to 2.0 format. I'm in the process of upgrading my Myth content so it sits alongside all the other upgraded cards. Just looking for any feedback on the card changes. I'll post the 1.0 and 2.0 versions here to make it easier. Seeing these versions side by side really shows why the monster card redesign was needed. That 1.0 card is darn hard to read. Especially for those of us "older" folks who struggle with small fonts. The is a really nice change. As far as feedback goes, I am especially interested in "club drubbing" and "humbling stomp". I think I have properly converted these, but would appreciate some backup here to make sure. Does the rewording make sense? Should anything be changed to make it more clear? As you can see, I also removed the "Burning" aspect of the first card because I didn't want to deal with a new condition, so I simply removed that ability. Thanks! Once I get this finalized, I will move onto the Agent I created and get her updated. From there, my plan is to tackle the first few stories I wrote and convert them into modules (they were more module-esk than stories back then, so maybe there's less conversion required ... we'll see).